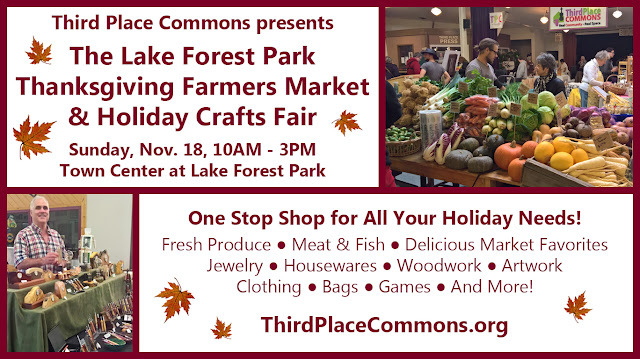 Don’t forget to join in the fun this Sunday, November 18th from 10-3 at Town Center of Lake Forest Park for Third Place Commons’ Thanksgiving Farmers Market and Holiday Crafts Fair. Get a jump on the Black Friday crowds with a day of wonderful shopping at the crafts fair full of jaw-dropping jewelry, amazing artwork, cozy clothing, creative contraptions, sweet-smelling soaps, wow-worthy woodworking, and more! Find something for everyone on your list (maybe even yourself). It’s sure to be a splendid day of shopping with all your holiday needs in one place! And don’t forget to mark your calendar for the final farmers market & crafts fair of the year on December 16th. Third Place Commons, a community-supported 501(C)3 nonprofit organization, presents the Lake Forest Park Farmers Market and Holiday Crafts Fair each year at the Town Center of Lake Forest Park, 17171 Bothell Way NE, Lake Forest Park.